Those honored for their success at the school and beyond included Joe Cyr '59, Casey Costigan '91, Debbie Godsoe Rand '96, Jarrett Lukas '07, Jake Leithiser '11 and Sargent Corporation. On Saturday six new members were inducted into the Old Town Athletic Hall of Fame. Those honored for their success at the school and beyond included Joe Cyr ’59, Casey Costigan ’91, Debbie Godsoe Rand ’96, Jarrett Lukas ’07, Jake Leithiser ’11 and Sargent Corporation. 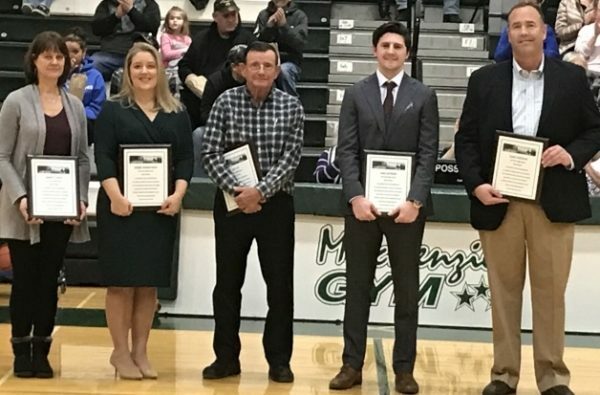 This year’s inductees were celebrated in an induction ceremony at the high school followed by a special recognition prior to the boys basketball game. The Class of 2018 is the seventh to be inducted and now includes 37 athletes, coaches and contributors.